Reflections on digital transformation at Minds + Machines 2016. Change happens faster these days — gradually and then suddenly, to quote Hemingway. The world is getting more and more complex. Especially since the U.S. elections earlier this month, many of us have been reading and reflecting on change, on uncertainty, trying to unpack and understand a result many didn’t expect. Last week I also went to GE’s Minds + Machines conference, our annual summit about the digital transformation of industry. Like the Industrial Internet itself, this event has been growing exponentially; our first conference five years ago included about 150 people in one room. This year, over 4,000 participated at Pier 48 in San Francisco. Walking around the tech hall I thought about how in technology — as in politics — we are both creating and trying to adapt to rapid change. Writing GE’s first vision paper on the Industrial Internet in 2012, I had asked myself — how can I convey how big this transformation will be? Last week I wondered — how do I keep up with it now? If you could not attend, you can get a sense of the buzz through #GEMM16 on Twitter. But you missed a lot (join us next year)! Here are my main impressions. In Jeff’s words — the change is truly all-encompassing. 1. The Industrial Internet is truly the rise of the machines. Utopian or dystopian, it’s happening. Check out Colin Parris’ give-and-take with the Digital Twin of an actual steam turbine operating in Southern California. Straight out of a Sci-Fi movie — and it’s happening now. This is just one of over half a million digital twins already in operation, starting from exactly zero one year ago. 2. The Industrial Internet is individual customization on a gigantic scale. Think about it: the industrial revolution was about building large numbers of identical machines, typified by the assembly line. The digital-industrial revolution is about understanding every single machine as a unique individual, to maximize its potential. These unique individuals — twenty billion machines will be connected to the internet by 2020 — become self-organizing systems, distributed intelligence. Beth Comstock gave an inspirational opening address, drawing on her biology background. Beth’s key message: we have entered the “emergent era”, the era of emergent systems. The only way to deal with this new world is to do it together. To connect individual intelligence into distributed intelligence. Beth gave the example of ants. One single ant is all but helpless. A colony of ants can do miracles. The same is increasingly true for us — crowdsourcing is just one example. And it is true for machines, as the digital twins start communicating and coordinating. I can’t do justice to Beth’s talk in this blog, so please watch it. In this clip, Jeff Immelt explains the transformation taking place within GE, and across industry. It’s all about productivity. As Jeff put it, “productivity is the gateway to the future”. The Predix team at GE Digital has been laying the groundwork, and the numbers talk for themselves: 19,000 developers onboarded in the first year, building more and more apps to boost asset performance management across sectors. Predix is the platform that enables Beth’s distributed intelligence vision. 4. …but what will this mean for human work? I know by now most of you are leaning towards the dystopian view of this emergent era. What about us? What about humans? My colleagues JP Soltesz, Paul Boris and I held a session on the Industrial Workforce of the Future. We wanted to address head on the widespread fear that the rise of the machines will bring mass unemployment and the worst income inequality we have ever seen. We started from a simple observation: across advanced economies, “productivity stinks” (Jeff’s words, not mine). In the U.S., employment is at the highest level ever. This is exactly the opposite of the “super productive machines and no workers” picture. So when they tell you that technology is already destroying jobs across the board, well, that just ain’t true. Will it happen? We don’t think so. New generations of wearable devices, from jackets to glasses, make workers smarter, faster, safer. The latest demonstration I saw from one of our partners, APX Labs, made a factory worker one-third faster on the job — without any prior training. Beth notes that factory floor workers have always been ‘hacking the system’, figuring out how to solve problems better and faster. Imagine what they will do with more powerful tools. This kind of innovation means better and safer jobs, higher productivity that will translate into higher wages. Yes, some jobs will be automated away; some workers will be temporarily displaced. We will have to work together to help them, to manage the transition. But we’ve always faced this challenge. Today’s workforce looks nothing like that of 50 years ago. The key is that technology can be a friend, not a foe. Many see Artificial Intelligence as the biggest threat; but invariably we find that a human and a machine together beat a machine alone every time, no matter how smart the machine. 5. The digital-industrial revolution is real. It is happening now. Five years ago the digital technology was not there yet, so we could only impress you with the scale of the machines it would be applied to. 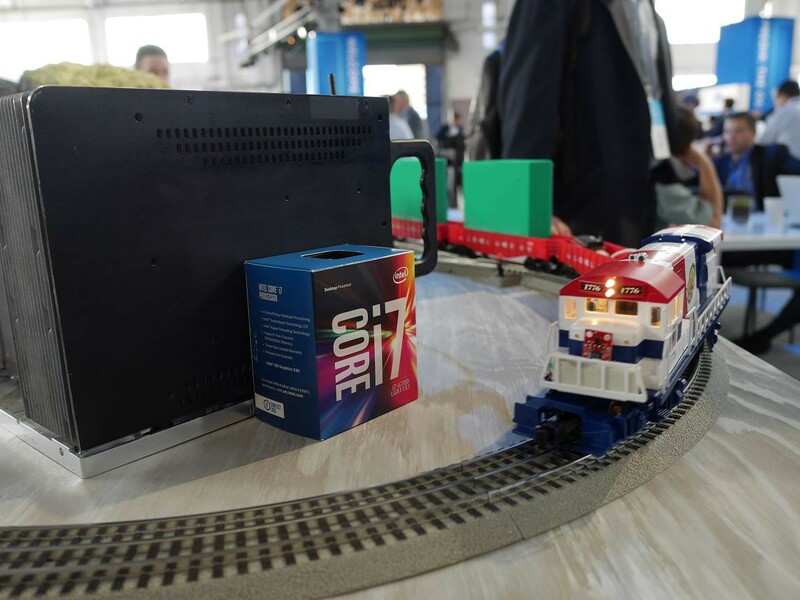 Today the digital technology is here, and even that little train, Predix-enabled, becomes a wonder. I would love to hear what you think and look forward to your comments here or on Twitter. Economics & innovation at Annunziata + Desai Advisors; Fellow in Residence at Autodesk. Former Chief Economist & head of business innovation strategy at GE.